Is Tai Chi really a martial art? Does what you learn really enable you to defend yourself? The short answer is yes, Tai Chi is a martial art. Progress in Tai Chi brings you crucial skills for self-defense. While Yang Chengfu more than a hundred years ago was teaching this martial art to selected soldiers of the imperial palace in Beijing, Tai Chi nowadays has been opened to the masses. As Tai Chi was introduced to a society that has little need for martial skills, it’s immensely positive influence on physical and mental health has certainly become a compelling factor leading to its popularization. But health is not the only reason to be fascinated with Tai Chi. When practicing Tai Chi, fighting is often the last thing we draw into consideration. However, one who truly wants to explore the deeper sides of Tai Chi will need to develop an understanding of its martial meaning and capacities, for which one will need a partner to practice with. Training alone and with a partner are two complementary units like Yin and Yang. Establishing a strong basis is the first thing to do: the body needs to get used to ideas like opening the joints and the Tai Chi specific term relaxation. Having completed this initial stage, you are ready to start learning Tuishou. Tuishou means pushing hands and upon learning it, it might very well be the first time a student is challenged to accommodate not just him or herself, but also a partner, to find a harmonious and meaningful exchange. As Tuishou is only one method of practice, with its own set of rules, one of the prerequisites is to not punch or kick. Its physical aspect is limited to pushing and yielding. For Tuishou, you first learn the upper body and then the lower body. For training the arms, each partner raises one arm, using the wrist as a contact point. The arms start circling: first simple circles, then more complicated circles. Each partner will add in his or her second hand and start adding more different contact points. Contact at first is only the wrist-palm area and then later moves towards the elbows, shoulders and even the entire upper body. First without any footwork, then in a fixed stance moving the weight forward and backward. Only after becoming comfortable with the preceding stages may one move on to moving steps. The practice of circles is eventually extended into the practice of applications: such as pushing, rolling back, warding off, etc. Preceding in this order, with relentless practice you will slowly develop your skills. Alongside Tuishou you will also start learning Fajin-exercises, which cover striking, pushing, and kicking techniques. When the body and mind can transition smoothly to meet all situations, without being hindered by the necessity to think, then once again the challenge can become more complicated. This is when you start learning Sanshou, which means free hands, a term for free fighting and sparring. If the student is not advanced enough to learn Sanshou, then he or she will not be able to profit much from the practice. He will become tense, his Qi moving upwards and his body becoming unrooted. He will try to use muscular force to overcome his partner and defend himself. This wrong use of force needs to be avoided, as within the Tai Chi philosophy it is seen as something weak, that can easily be abused by one’s opponent. At its pinnacle, Sanshou may include every little thing one has learned throughout his/her entire practice. The amount of discipline required to study Tai Chi to such completion is immense and that is exactly why in the hands of most people, Tai Chi will be a health program, rather than a martial art. However, if practiced as a martial art, there are no limitations. One can grow beyond his or her own style, and even grow to be able to meet, study, and spar with masters from other martial arts like Shaolin or Karate. What one intends to do with such a skill, in the end, is up to the individual. Aileen & Norman co-founded Interact China in 2004 with specialization in fine Oriental Aesthetic products handmade by ethnic minorities & Han Chinese. 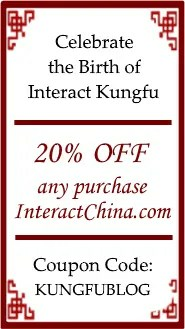 Having direct partnerships with artisans, designers, craft masters, and tailors, along with 12 years of solid experience in e-commerce via InteractChina.com, we are well positioned to bridge talented artisans in the East with the rest of the world, and directly bring you finely selected products that are of good quality and aesthetic taste. So far we carry 3000+ goods covering Ladies Fashion, Tailor Shop, Home Furnishings, Babies & Kids, Painting Arts, Textile Arts, Carving Arts, Tribal Jewelry Art, Wall Masks and Musical Instruments. Our team speaks English, French, German, Spanish and Italian, and serve customers worldwide with passion and hearts. P.S. We Need People with Similar Passion to Join Our Blogging Team! If you have the passion to write about Oriental Aesthetic in Fashion, Home Decor, Art & Crafts, Culture, Music, Books, and Charity, please contact us at bloggers@interactchina.com, we would love to hear from you! March 27, 2018 in Knowledge & Insight, Taijiquan & Qigong.